Alright, so I admit, I wasn’t sure what to expect from These Broken Stars. I hadn’t read any reviews or checked it’s rating on Goodreads… I downloaded the audiobook from my local library’s app based purely on the cover and the blurb. Even though the style of writing was beautiful, the story itself was – for lack of a better word – boring! Not much happened in the story. A huge chunk of it was spent describing what the two main characters were thinking. The plot drags at a snail’s pace. Which just adds to the “boringness” of it all (I honestly don’t know how I managed to finish this book without DNF-ing it). The story is set in a whole new planet, which is a great opportunity to build a fantastic world. Sadly there was very little world-building in this book. 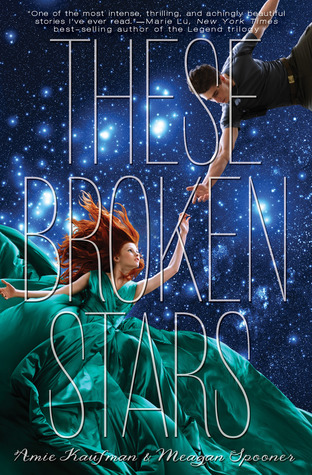 I’m really sorry to say that These Broken Stars was a rather disappointing book. BUT this is just my personal opinion. I’m sure someone, somewhere would have given it more than 2.5 stars. Have YOU ever read this book? What did you think of it? What’s your take on Booktube? Too bad you didn’t like it! I loved it for the exact reasons you didn’t, haha. I went in expecting it to be just another plot-based YA adventure, but when it wasn’t, I was sooooo pleasantly surprised! I was so deeply engrossed in the characters and I wish more YA did that. The other two books in the trilogy are much more plot-based and action-packed, if you want to read on. I’m glad you liked it! But I’m not sure I’ll be reading the rest of the trilogy… haha! I’ve been thinking about reading this one for a while but just haven’t gotten around to it. I’ve seen mixed reviews, so I’m not sure whether I would enjoy it or not.